Today, I'm sharing with you a card I made for a New Stamp Set swap that I participated in last night. I also made a similar one of these for convention displays. I would have re-created that one exactly but one of the background stamps I used for it sadly retired. This card uses Sweet Season a stamp set that was given to convention participants. While this set is billed as a holiday set, I really liked using it for something other than a holiday card. I think this is such a bright and cheery card! I hope I'll have time to post more later. I'm heading over to the Salt Place to check in and hang with friends and then have Make & Take helper training this afternoon. 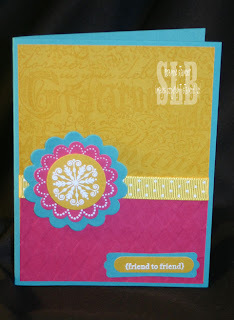 Your card is totally adorable!, and I love the bright colors!! Stunning work! !